A summit between President Trump and North Korean Leader Kim Jong Un took place on June 12, 2018. An agreement between the two was signed but more in-depth talks between the United States and North Korea are scheduled to continue. Ultimately, negotiations with North Korea are the best way to reduce the threat the country's nuclear weapons pose to the United States and its allies in the long-term. But follow-on negotiations have to show progress for the United States, and Donald Trump has seemed far too willing to accommodate North Korean and Chinese demands. Security guarantees coordinated with US allies, especially South Korea and Japan. Alienated US allies who are critical to securing a deal with North Korea. President Trump gave away more than he gained for the United States at his summit with Kim Jong Un. While repeatedly fawning over him, Trump elevated the tyrant Kim on the world stage, claimed a victory lap for signing a weak and vague agreement that does little to address the nuclear threat from North Korea, and was outmaneuvered by China. US President Donald Trump met with North Korean leader Kim Jong Un in Singapore on June 12, 2018. This was the first time a sitting American president has ever met with the leader of this reclusive regime. The two discussed North Korea’s nuclear weapons program in an effort to negotiate a resolution to the ongoing tension between North Korea and the global community. President Trump and Kim Jong Un signed an agreement after this summit. It contained only four vague commitments: (1) establishing new US-North Korean relations; (2) building lasting and stable peace on the Korean Peninsula, (3) reaffirming the North Korean commitment toward complete denuclearization, and (4) recovering remains of prisoners of war or those missing in action. Despite Trump’s insistence that North Korea is no longer a threat to the United States, North Korea continues to pose a tremendous threat to the United States and its Asia Pacific allies through both its nuclear and conventional arsenals. North Korea has spent years developing and testing nuclear weapons that threaten the region, including our allies, South Korea and Japan. Now, thanks to advances in its ballistic missile technology, North Korea has a functional nuclear weapon and inter-continental ballistic missiles capable of striking parts of the continental United States.1 Tensions between North Korea, the United States, and our allies have increased with the North’s advancement of its nuclear and ballistic missile programs. The situation is further complicated by the fact that North and South Korea technically remain at war after the Korean War ended only in an armistice. In addition to nuclear weapons, North Korea has packed enough conventional firepower on its border to destroy the South’s capital, Seoul, in a matter of hours if active hostilities ever broke out.2 It also has a large arsenal of chemical and biological weapons. A war on the Korean Peninsula could lead to the deaths of millions of people on both sides of the border, including possibly hundreds of thousands of Americans.3 To quell this threat, it must be dealt with through negotiations to denuclearize North Korea. The Trump Administration has said that negotiations with North Korea over its nuclear weapons program will continue after this summit.5 Any further agreement between the United States and North Korea must be smart and tough and include actionable steps the North will commit to for complete, verifiable denuclearization. A smart and tough deal with North Korea would immediately eliminate the country’s ICBM capabilities as this presents a direct threat to the United States. While it is a positive step that North Korea has agreed to suspend its ICBM testing to allow for negotiations,8 the country has made no commitment yet regarding its ballistic missile program. The United States and its allies as well as the United Nations have imposed a series of sanctions on North Korea for both its nuclear and ballistic missile programs. But these sanctions have not put a stop to the country’s advancement of these programs, and many issues remain in getting other countries to comply with these sanctions and not do business with North Korea.9 Any deal made by the United States must aim to eliminate the threat of North Korea’s ICBMs and address the threat of all ranges of its delivery vehicles to protect America’s allies. Any final deal Trump makes with North Korea must focus on laying out specific, measurable steps the country will take to eventually eliminate its arsenal of nuclear warheads, including the massive amount of fissile material it holds to continue to fully assemble new warheads. The ultimate end-goal of any negotiated deal should be the complete, verifiable denuclearization of North Korea. North Korea could now try to avoid its commitments by playing on differences in definitions with the United States on what denuclearization would mean. North Korea had threatened to cancel the summit over US insistence that “unilateral nuclear abandonment” is the starting point for negotiations. Instead, North Korea wants denuclearization to apply to the entire Korean Peninsula, including the removal of US conventional forces on the Peninsula, which could mean abandoning our South Korean allies.17 The summit did not resolve this fundamental tension, which now must be addressed. The most effective strategy the United States should pursue to combat this untrustworthiness going forward is not to trust but verify compliance with all terms regarding North Korea’s nuclear weapons program. This must include an agreement by North Korea to declare the scope of its nuclear program and then an extensive architecture established to allow international inspectors to verify the scope of the North’s program and regularly inspect that the country is upholding its end of any deal. North Korea has a track record of talking, shaking hands with high-level diplomats, signing agreements—only to break them. President Trump has already approached negotiations with such eagerness, that it continues to put the United States in a weaker negotiating position going forward. The United States should instead move forward with a renewed focus on measurable denuclearization—including a strong and transparent verification and inspection regime—and not be satisfied with symbolic gestures. The United States has strong partnerships with South Korea and Japan, who are essential negotiating partners. The United States has signed separate treaties with South Korea and Japan that provide for the mutual defense of our nations. Over 28,000 American troops are stationed in South Korea18 and around 40,000 are in Japan19—in part to deter against North Korean aggression. These servicemembers would bear the greatest American cost of any conflict with North Korea, which is why any security guarantees in these negotiations must be carefully coordinated with our allies. North Korean has demanded in the past that the United States withdraw its forces from the Korean Peninsula in exchange for ending its nuclear weapons program. If North Korea renews this demand in follow-on negotiations and the Trump Administration were to cave, this could further undermine the US relationship with its allies while strengthening China’s hand in the region. Any negotiations on a change in the US force posture in the region must be coordinated with these allies. It appears that President Trump has already caved in to North Korean demands to cancel joint military exercises with South Korea.20 These joint exercises are essential preparation to ensure American troops, working with South Korean partners, are ready for conflict. Canceling them undermines American military readiness. The United States should not make concessions that weaken our military while the threat from North Korea’s nuclear weapons program remains unabated. Any further concessions should be reciprocal as North Korea takes specific steps of their own. The Trump Administration has said it wants to “quickly” achieve denuclearization in North Korea while believing this can be done in one or a few meetings.21 There have been many agreements made with North Korea under previous US administrations that the North has not abided by. To think this will be a quick process is to ignore the history of North Korean nuclear negotiations. Decades of sanctions and isolation of the North Korean regime have only caused the country to advance its nuclear weapons and ballistic programs, not to dismantle them. North Korea will not just hand over its weapons without getting something in return, and there is no history to suggest otherwise. The Trump-Kim summit must be viewed as the beginning of a negotiation process—not the end in and of itself. Because the United States could not address all of the key issues for a tough and smart deal, it needs to keep returning to the table until it can. The Trump Administration has claimed symbolic steps as “victories”22 before the Trump-Kim summit was even held and, in doing so, lowered expectations for what the United States would accept as an outcome. The goal for a deal with North Korea is reducing the threat the country poses to the United States, not simply gaining publicity for the President. It is possible that North Korea’s destruction of its nuclear test site may have been only a symbolic gesture or, at worst, a total ruse. Only journalists—not nuclear experts—were on site to verify whether the destruction was done fully and is not reversible.23 The release of three American hostages were seen as important confidence-building measures leading into negotiations, but these actions also underscore the brutality and capriciousness of the Kim regime. While the United States first insisted on North Koreas’ complete denuclearization, later, Trump shifted to demanding a series of steps. Then President Trump lowered expectations for the summit as simply an opportunity to get to know Kim Jung Un. But negotiating against himself is no way to achieve a good outcome for America. The United States must go into further negotiations with a clear, realistic strategy, viable end-goals, and strong demands for North Korea. The agreement signed by President Trump and Kim Jong Un did not include any agreed-upon definitions or commitments as to how North Korea will denuclearize and what verification for this process would look like. By inflating small concessions as big “victories,” the United States is sending the wrong signal to North Korea that our biggest priority is achieving a deal the Administration can showcase, not a smart and tough one. China continues to whisper in North Korea’s ear throughout this process. Kim visited China immediately before the summit and shortly thereafter—meeting both times with Chinese President Xi Jinping. The resolution of hostilities with North Korea must not also open the door for China to have more power and impose its will on US allies in the region. China’s cooperation and leverage would likely be critical for an effective and sustainable deal with North Korea,24 but China is playing the long game. China continues to threaten our allies over a number of territorial disputes, and it has a history of malicious behavior toward the United States (like cyber-attacks).25 Already, President Trump has signaled a willingness to end the ban on Chinese telecommunications company ZTE from doing business in the United States, even though the US intelligence community has said it presents a security threat to American consumers.26 While the President’s motivations for doing so are unclear, the United States must be careful not to intentionally or inadvertently make China the big winner in negotiations. The Administration was unprepared for the summit, which showed in a lack of consistent strategy and messaging on North Korea. This only served to create chaos and confusion instead of advancing peace. For example, the Administration’s mixed-messaging on whether it would be using Libya as a model for negotiations and what that means only served to reinforce North Korea’s long-standing fears that the United States is solely interested in removing the country’s leadership from power. Libya abandoned its much less advanced nuclear program in 2003; the country’s leader Muammar Gaddafi was killed by his own people following a US-led military intervention in 2011. By mentioning Libya and then backtracking, at the very least it shows North Korea and the rest of the world that the Administration is not presenting a united front on policy goals for North Korea. An effective and sustainable deal with North Korea can only be negotiated if our partners in the region are in lock-step with us. Any effective deal going forward will likely have to involve changes to US and international sanctions on North Korea. For that to work, US partners in imposing these sanctions must agree to do so. Keeping them in the dark on negotiations will only set up a deal for failure. This deal signed between Trump and Kim may actually end up hurting America’s security instead of bolstering it. It made vague promises of “denuclearization” in exchange for security guarantees, but included no specific, measurable steps on either. It further failed to even offer an agreed upon definition of denuclearization, which has been a major sticking point in past agreements. Trump sacrificed the readiness of American troops in South Korea without achieving any major concessions from North Korea. He has given North Korea legitimacy as a nuclear power on the global stage while giving away key leverage the United States had for negotiations. Moreover, by praising Kim Jong Un profusely, despite his grotesque human rights record, Trump has made the United States look desperate for a deal while giving credibility to a brutal dictator. While the Trump-Kim summit achieved little, we must look toward the next tasks at hand: achieving measurable outcomes from the Kim regime that actually eliminate the threat of its nuclear weapons program. America’s security will suffer further if the Trump Administration continues to fall into the same traps it already has and the United States signs another weak and vague deal in follow-on negotiations. North Korea poses a tremendous threat to the United States and its Asia Pacific allies. Ultimately, negotiations are the best option to reduce the threat of North Korea and maintain the security of the United States and its regional allies. But a smart and tough deal with North Korea must include strong and transparent inspection and verification mechanisms to ensure the North is not able to cheat on any deal, be closely coordinated with US regional allies who provide critical deterrence against North Korean aggression, and eliminate the capability of North Korea to hit the United States with a nuclear bomb. In signing the June 12 deal with Kim Jong Un, President Trump gave more and got less than any American President before him. American national security hangs in the balance if the next time around he can’t get a better deal. William J. Broad et al., “This Missile Could Reach California. But Can North Korea Use It With a Nuclear Weapon?” The New York Times, Sept. 3, 2017. Accessed July 12, 2018. Available at: https://www.nytimes.com/interactive/2017/08/22/world/asia/north-korea-nuclear-weapons.html. Anthony Cordesman, “The Other Side of the North Korean Threat: Looking Beyond Its Nuclear Weapons and ICBMs,” Center for Strategic and International Studies, March 16, 2018. Accessed June 5, 2018. Available at: https://csis-prod.s3.amazonaws.com/s3fs-public/publication/180319_North_Korean_Threat.pdf?1VsEASqI1yuaGdWdKkFHiW6PPQIfgN7P. Kathleen J. McInnis, Andrew Feickert, Mark E. Manyin, Steven A. Hildreth, Mary Beth D. Nikitin, & Emma Chanlett-Avery, “The North Korean Nuclear Challenge: Military Options and Issues for Congress,” Report, Congressional Research Service, Nov. 6, 2017, p. 18. Accessed June 5, 2018. Available at https://fas.org/sgp/crs/nuke/R44994.pdf. Evan Osnos, “The Biggest Winner at the US-North Korea Summit: China,” The New Yorker, June 12, 2018. Accessed June 20, 2018. Available at: https://www.newyorker.com/news/daily-comment/the-biggest-winner-at-the-us-north-korea-summit-china. Jessica Donati and Louise Radnofsky, “Trump, Pompeo offer conflicting versions of North Korea talks,” The Wall Street Journal, June 15, 2018. Accessed June 18, 2018. Available at: https://www.wsj.com/articles/trump-says-he-has-solved-north-korea-nuclear-threat-1529072121. “Missiles of North Korea,” Center for Strategic and International Studies, Missile Defense Project. Accessed June 5, 2018. Available at: https://missilethreat.csis.org/country/dprk/. Nuclear Threat Initiative, “North Korea.” Accessed June 5, 2018. Available at: http://www.nti.org/learn/countries/north-korea/delivery-systems/. Anna Fifield, “North Korea says it will suspend nuclear missile tests, shut down test site,” The Washington Post, April 20, 2018. Accessed July 12, 2018. Available at: https://www.washingtonpost.com/world/north-korean-leader-suspends-nuclear-and-missile-tests-shuts-down-test-site/2018/04/20/71ff2eea-44e7-11e8-baaf-8b3c5a3da888_story.html?utm_term=.d45605faac41. Eleanor Albert, “What to Know About the Sanctions on North Korea,” Council on Foreign Relations, January 3, 2018. Accessed June 5, 2018. Available at: https://www.cfr.org/backgrounder/what-know-about-sanctions-north-korea. Joby Warrick, Ellen Nakashima, Anna Fifield, “North Korea now making missile-ready nuclear weapons, US analysts say,” The Washington Post, August 8, 2017. Accessed July 12, 2018. Available at: https://www.washingtonpost.com/world/national-security/north-korea-now-making-missile-ready-nuclear-weapons-us-analysts-say/2017/08/08/e14b882a-7b6b-11e7-9d08-b79f191668ed_story.html?utm_term=.5e2a72a9ff38. Hans M. Kristensen, “North Korean nuclear capabilities, 2018,” Bulletin of Atomic Scientists, January 8, 2018, Accessed June 5, 2018. Available at: https://www.tandfonline.com/doi/full/10.1080/00963402.2017.1413062. Joby Warrick, Ellen Nakashima, Anna Fifield, “North Korea now making missile-ready nuclear weapons, US analysts say,” The Washington Post, April 20, 2018. Accessed July 12, 2018. Available at: https://www.washingtonpost.com/world/national-security/north-korea-now-making-missile-ready-nuclear-weapons-us-analysts-say/2017/08/08/e14b882a-7b6b-11e7-9d08-b79f191668ed_story.html?utm_term=.5e2a72a9ff38. Hans M. Kristensen, “North Korean nuclear capabilities, 2018,” Bulletin of Atomic Scientists, January 8, 2018. Accessed June 5, 2018. Available at: https://www.tandfonline.com/doi/full/10.1080/00963402.2017.1413062. “Agreed Framework of 21 October 1994 Between the United States of America and the Democratic People’s Republic of Korea,” International Atomic Energy Agency, Nov. 2, 1994. Accessed June 5, 2018. Available at: https://www.iaea.org/sites/default/files/publications/documents/infcircs/1994/infcirc457.pdf. “Application of Safeguards in the Democratic People’s Republic of Korea,” International Atomic Energy Agency,” Sept. 2, 2011. Accessed June 5, 2018. Available at: https://www.iaea.org/About/Policy/GC/GC55/GC55Documents/English/gc55-24_en.pdf. Kelsey Davenport, “Chronology of US-North Nuclear and Missile Diplomacy,” Arms Control Association. Accessed May 15, 2018. Available at: https://www.armscontrol.org/factsheets/dprkchron. “Hearing to Receive the Testimony on US Pacific Command and US Forces Korea in Review of the Defense Authorization Request for Fiscal Year 2017 and the Future Years Defense Program,” United States Senate, Feb. 23, 2016. Accessed July 12, 2018. Available at: https://www.armed-services.senate.gov/imo/media/doc/16-15_02-23-16.pdf. Kristen Bialik, “US active-duty military presence overseas is at its smallest in decades,” Pew Research Center, Aug. 22, 2017. Accessed June 5, 2018. Available at: http://www.pewresearch.org/fact-tank/2017/08/22/u-s-active-duty-military-presence-overseas-is-at-its-smallest-in-decades/. Helene Cooper and Mark Landler, “Trump’s promises to Kim Jong-un leave US and allies scrambling,” The New York Times, June 15, 2018. Accessed June 18, 2018. Available at: https://www.nytimes.com/2018/06/15/world/asia/us-trump-north-korea-credible-military-exercises.html. Steve Holland, “Exclusive: Trump – nuclear deal may take more than one meeting with North Korea’s Kim,” Reuters, May 31, 2018. Accessed July 12, 2018. Available at: https://www.reuters.com/article/us-northkorea-usa-trump-interview-exclus/exclusive-trump-nuclear-deal-may-take-more-than-one-meeting-with-north-koreas-kim-idUSKCN1IW2CQ. United States White House, “What You Need To Know About The President’s Victory For The World By Freeing Three Brave Americans,” May 10, 2018. Accessed June 5, 2018. Available at: https://www.whitehouse.gov/articles/need-know-presidents-victory-world-freeing-three-brave-americans/. Elise Hu, “North Korea Demolishes Its Nuclear Test Site In A ‘Huge Explosion,’” National Public Radio, May 24, 2018. Accessed July 12, 2018. Available at: https://www.npr.org/sections/parallels/2018/05/24/613465473/north-korea-demolishes-its-nuclear-test-site-in-a-huge-explosion. Eleanor Albert, “The China-North Korea Relationship,” Council on Foreign Relations, March 28, 2018, Accessed May 22, 2018. Available at: https://www.cfr.org/backgrounder/china-north-korea-relationship. Wayne M. Morrison, “China-US Trade Issues,” Report, Congressional Research Service, April 16, 2018. Accessed June 5, 2018. Available at: https://fas.org/sgp/crs/row/RL33536.pdf. Derek Hawkins, “Trump’s ZTE reversal flouts warnings from top national security officials,” Chicago Tribune, May 14, 2018. Accessed July 12, 2018. Available at: http://www.chicagotribune.com/business/ct-biz-trump-zte-reversal-national-security-20180514-story.html. “Pompeo Says Will Work To Strengthen, ‘Fix” Iranian Nuclear Deal,” Radio Free Europe, April 13, 2018. Accessed July 12, 2018. Available at: https://www.rferl.org/a/pompeo-trump-pick-secretary-state-says-will-work-strengthen-fix-iranian-nuclear-deal/29163468.html; David E. Sanger & Rick Gladstone, “Contradicting Trump, U.N. Monitor Says Iran Complies with Nuclear Deal,” The New York Times, Aug. 31, 2017, https://www.nytimes.com/2017/08/31/world/middleeast/un-nuclear-iran-trump.html. Joohee Cho and Hakyung Kate Lee, “South Korea ‘baffled,’ ‘very regretful’ over Trump’s cancellation of North Korea summit,” Reuters, May 24, 2018. Accessed July 12, 2018. Available at: https://abcnews.go.com/International/south-korea-baffled-regretful-trumps-cancellation-north-korea/story?id=55409572. United States White House, “Letter to Chairman Kim Jong Un,” May 24, 2018. Accessed June 5, 2018. 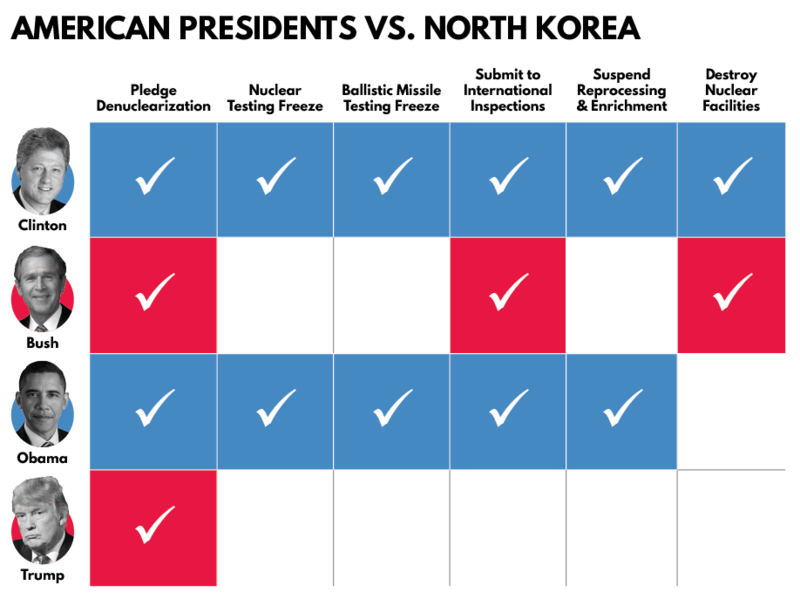 Available at: https://www.whitehouse.gov/briefings-statements/letter-chairman-kim-jong-un/. Ankit Panda, “No, North Korea Hasn’t Blown Up ‘Launch Sites’ After the June 12 Summit,” The Diplomat. June 18, 2018. Accessed June 18, 2018. Available at: https://thediplomat.com/2018/06/no-north-korea-hasnt-blown-up-missile-launch-sites-after-the-june-12-summit/. Joseph S. Bermudez, Jr., “More on North Korea’s Missile Test Sites,” 38North, June 15, 2018. Accessed June 18, 2018. Available at: https://www.38north.org/2018/06/testsites061518/. John Haltiwanger, “North Korea’s demolition of its only nuclear test site may have just been a show for the cameras,” Business Insider, June 2, 2018. Accessed June 18, 2018. Available at: http://www.businessinsider.com/north-korea-nuclear-test-site-may-not-have-really-been-destroyed-2018-6. Brian Barrett, “All the Times North Korea Promised to Denuclearize,” Wired, June 12, 2018. Accessed June 18, 2018. Available at: https://www.wired.com/story/north-korea-summit-denuclearize-history/.